Virtual functions required by the StepHandler class. Get a pointer to the EventHandler which made the last call to handle(). Set a pointer to the EventHandler which made the last call to handle(). If a new step has been created, return it, otherwise return the current step from the eventHandler(). Return a reference to the last selected XComb. Return a pointer to the last selected XComb. If the last selected XComb object belongs to a group of XComb's return a reference to the head XComb object for this group. If the last selected XComb object belongs to a group of XComb's return a pointer to the head XComb object for this group. Return a reference to the currently used EventHandler. A pointer to the currently used parton extractor. A reference to the currently used kinematical cuts. A pointer to the currently used kinematical cuts. Return the pair of incoming parton instances. The last generated total energy squared of the incoming particles. The last used interval in total parton-parton energy squared. The generated rapidity of the hard scattering sub-system. Return 1-lastX1() to highest possible precision for x 1. Return 1-lastX2() to highest possible precision for x 1. The product of the parton density functions at the last generated phase-space point. The chosen scale of the hard scattering. 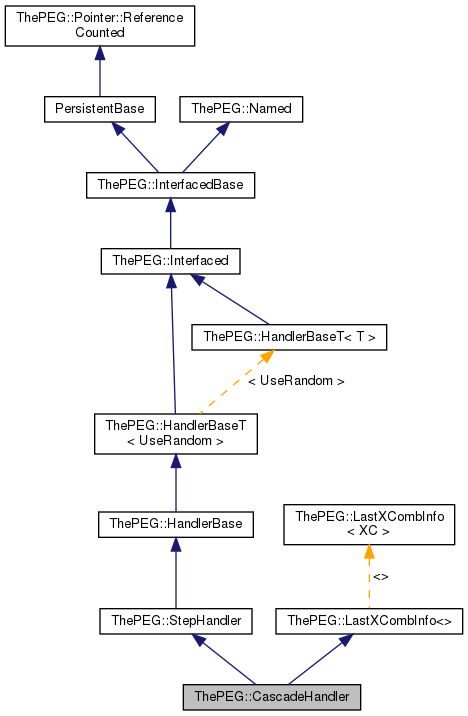 Return the momenta of the incoming and outgoing partons to be used by the matrix element object, in the order specified by the TreeDiagram objects given by the matrix element. Return the last preweight factor. Get the last jacobian obtained when generating the kinematics for the call to dSigHatDR. Return the coupling weight as calculated for the last phase space point. Return the SubProcess object corresponding to the last generated sub-process. Return the incoming and outgoing parton types to be used by the matrix element object, in the order specified by the TreeDiagram objects given by the matrix element. Store the tagged argument given to handle(). Store the Hint arguments given to handle(). The pdfs used to extract the incoming partons. If there are multiple cascade calls, this flag tells if cascade was called before. Access information stored by the handle() function. Return the int provided in the current call to handle(). Return references to the PDF used by the first incoming particle. Return references to the currently used PDF's. Set alternative PDFBase objects to be used for cascade. Set the XComb object with information about the sub-process generation. Return true, if this cascade handler will perform reshuffling from hard process masses. For multiple cascade calls, this flag tells if cascade was called before. Set the flag to inform if prior cascades had been called. Use the collision handler to create a new step. The pointer to the last selected XComb. The CascadeHandler is the base class of all handlers implementing perturbative partonic cascade models. It is derived from the more general StepHandler class, and implements the handle() function to do some standard initialization before calling the main cascade() function. The interfaces defined for CascadeHandler. Definition at line 33 of file CascadeHandler.h. The main function to be overwritten by sub-classes. It is called by handle() after storing some information which is then available through simple access functions. The main function called by the EventHandler class to perform a step. eh the EventHandler in charge of the Event generation. tagged if not empty these are the only particles which should be considered by the StepHandler. hint a Hint object with possible information from previously performed steps. Veto if the StepHandler requires the current step to be discarded. Stop if the generation of the current Event should be stopped after this call. Exception if something goes wrong. The CascadeHandler can be used inside the process generation to do so-called CKKW reweighting of the hard sub-process. In this case this function is called after information about the sub-process is made available through the LastXCombInfo base class. Only the function belonging to the primary CascadeHandler for the event to be generated is called. Sub-classes may implement it to give a suitable weight in return. The CascadeHandler may store information about the generated sub-process to be used in the subsequent cascade. It is however not guaranteed that the reweightCKKW() will have been called for the subprocess handed to the handle() function. This default implementation of the function simply return one. The current sub-process is mixed together with other processes with a multiplicity of outgoing particles between minMult and maxMult. Return the vector of tagged particles which should be showered. It the vector is empty, the patons from the current sub-process is supposed to be showered. Definition at line 102 of file CascadeHandler.h. Indicates that this is an abstract class without persistent data. Definition at line 196 of file CascadeHandler.h.